This issue has been carefully considered by transportation and safety experts for many years and the lack of safety harnesses on school buses is intentional. Are the experts correct? Let’s examine both sides of this issue. First, let’s consider the reasons why seat belts are not the norm on most school buses. When you share a vehicle with your child, you monitor his or her behavior. Furthermore, you are the one to ensure he or she is seated and wearing his or her seat belt properly. However, who watches your son or daughter on a school bus? Who determines proper positioning of the seat belt so it does not constrict your child’s neck or stomach? The school bus driver must remain alert and focused on the road and cannot monitor every action of your child. The cost to install seat belts is an estimated $7,000-$10,000 per bus and many school districts simply cannot afford it. Your car is designed to transport you and your family. Depending on whether you own a passenger car, SUV or mini-van, your vehicle may carry anywhere from four to eight people. A school bus is designed to carry anywhere from two to three passengers per seat, sometimes up to 60 passengers per bus. The American School Bus Council explains that school buses are designed like egg cartons, with high, thickly padded seatbacks. The goal is to provide stable cushioning and an impact-resistant shell to offer maximum protection for passengers. Whether your child rides in a smaller school bus or a full-sized model, buses are multi-purpose vehicles. The seats and general bus structure are designed to accommodate very young children as well as 18-year-old athletes in full sports equipment. 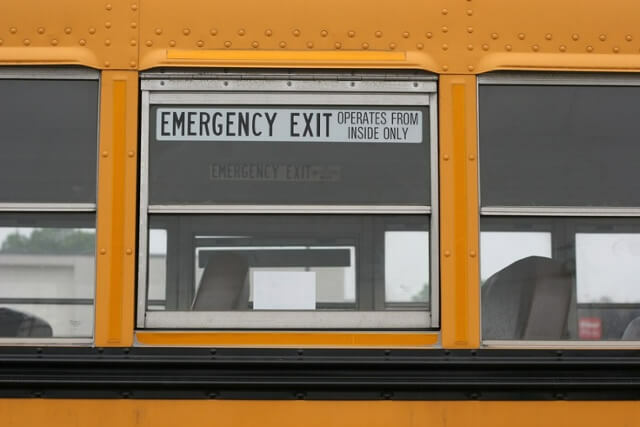 In the event of an accident or fire on the school bus, passengers must be able to evacuate the vehicle as quickly as possible. Seat belts may delay the time it takes for children to safely exit the vehicle. According to the National Highway Traffic Safety Administration (NHTSA), new school buses of 10,000 pounds or less must have lap-shoulder belts. Additionally, the NHTSA recently allowed states or local jurisdictions to choose whether or not to install safety belts on larger school buses (more than 10,000 pounds). Currently, six states have passed some form of school bus seat belt law, including California, Florida, Louisiana, New Jersey, New York and Texas. For bumpy rides and fender benders, high seat backs and extra padding is sufficient. However, in the event of a rollover accident, children may be tossed and flung about the cabin of the bus. Seat belts eliminate this problem by keeping children fastened to the seat. Some bus drivers, bus monitors, and school districts report less bullying when children are properly fastened in their seat belts. These seat belts can prevent bullying as they restrict children from running about the bus and harassing others. Many school districts cite cost as one of the issues preventing the installation of seat belts in their school bus fleets. However, considering that the average school bus remains in service for between 10-15 years, the cost of installing seat belts in school buses significantly drops over time. The debate over seat belts on school buses is not black and white. Each side has benefits and drawbacks that must be considered by school districts based on jurisdiction, funding and other pertinent factors.